If you want to change your traditional TV & LCD monitor into a intelligent platform which just like a Tablet PC. The TV Box is you great choice and can meet your demand because it can change your traditional TV & LCD monitor into a multimedia center by connecting the Internet (Via WiFi or RJ45). It can combine the Internet with the TV to build a new entertainment system, letting you can greatly enjoy videos, music, photos, etc and install or uninstall software, games and application programs. This TV Box will bring you much fun and let you relax yourself. Featured with the Latest Android 5.1 Lollipop system, this TV Box is more stable than Android 4.4 operation system. 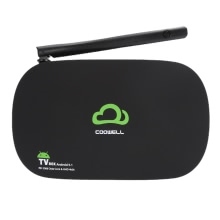 You can access to thousands of films, TV, Live Sport, Music and more with Coowell V3 smart TV Box. Powered by Rockchip 3368 Octa-Core 64Bits, Coowell V3 smart TV Box is a HD media player with SGX 6110 high performance GPU (supports OpenGL ES3.1) that can reach speed of up to 1.5GHz. The reading and operating speed is faster and more stable with 2GB DDR3, 16GB EMMC; 2.4G Wi-Fi, 1000M LAN and Bluetooth 4.0 make home entertainment become easy. Preconfigured with XBMC / KODI, you can download numerous add-ons, like YouTube, Netflix, FaceBook, Twitter, Skype and more; it also alows you to play thousands of Android games in a large screen smoothly. OS: Android 5.1, offering thousands of Android applications, brings you much fun & convenience. Supports KODI / XBMC, 3D movie function. Online Function: Browse all video websites, support Netflix, Hulu, Picasa, YouTube, Twitter, FaceBook, etc. Medium: Local Media playback, support HDD, U disck ,Micro SD card. Video: MKV, WMV/VC-1 SP/MP/AP, MPG, MPEG, dat, avi, mov, iso, mp4, rm, H.264, H.265, realVideo8/9/10, etc. up to 2160P. Photo: JPG, JPEG, MJPEG, PNG. Tips: the remote controller of the product belongs to attached and functional accessory. If part of product functions can&apos;t be controlled by the controller, please purchase external mouse or air mouse. You will have a better using experience.